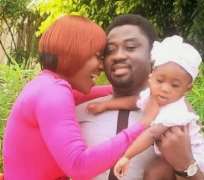 Mercy Johnson, who is a star Nollywood actress and wife of an Edo State-born oil and gas businessman, Prince Odi Okojie, has shared a recent family picture. The Kogi State-born make-believe queen posted a picture showing her husband and her 10-month-old baby named "Purity' and tagged it 'happy Sunday'. Mercy Johnson is one of the best talented actresses in Nigeria. She is also highly loved by movie buffs. However, Mercy Johnson is yet to feature in a major big screen film, but has featured in droves of silver screen movies. In 2011, she married her hubby in a controversial manner, a scenario has termed her as an alleged 'husband snatcher'. The couple had their first child in December 2012 in the United States of America (USA).